I think of myself as a sensorialist, a writer, a text walker, a maker, and as an artist whose integrated practice brings me over and over again to the water’s edge, to thinking about the relationships between history, language, and location and between what is spoken and what is heard. Working with the felt and the found, I am drawn to slow conversations and everyday poetics. I currently live in Calgary, Alberta, having moved back here in the summer of 2016. It makes sense in a way that I’ve returned, since I’m continually drawn to the Rockies and the terrain along the Bow River and I still consider myself a prairie farm kid. The Alberta landscape is in my blood it seems, and once again I find the skies here filling me with daily awe. While I live here, I continue to also have a fondness for the sounds of Montreal and Washington, D.C. and for the waters and history around Vancouver. And although I have never lived in Boston, Fenway also has a special place in my heart (yes, I’m a huge Red Sox fan). I’ve previously taught, mostly part time, at the University of Calgary in Calgary, Alberta; at Concordia University in Montréal, Quebec; at Emily Carr University of Art + Design in Vancouver, British Columbia; and most recently at Goddard College in Plainfield, Vermont. While working with students over the years has been such a wonderfully rich experience, I’m now making a shift in order to more fully immerse myself in my creative practice and to see where the days will lead me. 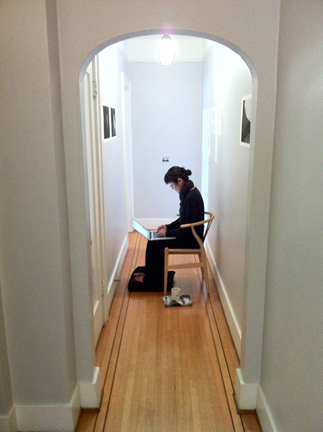 J. D. Brown took this photograph of me, in one of the early iterations of my hallway studio (in Vancouver 2011).